I feel it is important to learn and understand my clients and their business ventures rather than just their legal needs. Working side-by-side with clients in every area of their business not only enables me to identify practical solutions that are in line with each client’s unique culture and work environment, but also allows me to serve as part of their team, rather than just their lawyer. Pat is known for his legal and educational experience in the healthcare industry, making him a sought-after resource for clients and students alike. His primary areas of practice are related to Transactional and Administrative Healthcare, Corporate, Securities and Antitrust matters. He is also a Professor of Healthcare Studies at Baylor University School of Law where he oversees the healthcare law program and teaches Healthcare Law, Healthcare Fraud and Abuse and Regulation of Healthcare Professionals. 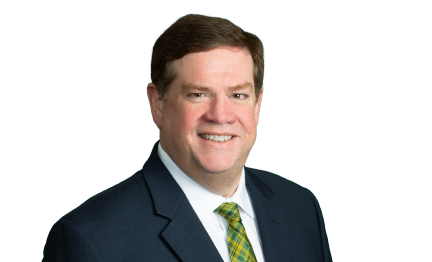 Pat is also involved with the Robbins Institute for Health Policy and Leadership at the Baylor University Hankamer School of Business where he teaches Healthcare Law and Ethics in its M.B.A. in Healthcare Administration Program and Executive M.B.A. Program. He is Board Certified in Healthcare Law by the Texas Board of Legal Specialization and has completed the training by the American Health Lawyers Association as a Mediator and Arbitrator. Pat has successfully defended a medical management company in a legal dispute over a mutual mistake as to the property description and the amount of land conveyed at the time of closing. The land in question was used to build a medical office building to house the primary pediatric practice for a five county area in rural East Texas. In Gilbard-Smith v. Perry, 323 S.W.3d 709, the Dallas Court of Appeals reversed the trial court's decision in favor of the previous landowner and rendered judgment in favor of Gray Reed's client. From a corporate securities perspective, Pat successfully defended an international financial consultancy entity against claims it tortiously interfered with a business relationship between another financial consultant and its client. In Greentree Financial Group, Inc. v. Long Fortune Valley Tourism, et al, 824 F. Supp. 2d 1363, the U.S. District Court for the Southern District of Florida granted Defendant's Motion to Dismiss Amended Complaint stating Plaintiff had failed to allege sufficient facts for it to maintain the lawsuit against Gray Reed's client. The other Defendants settled prior to the Court rendering its decision. Medicare Appeals Process: Is the End of the Deadlock Anywhere In Sight and What Relief Is Available? Co-author, Physician Law Evolving Trends and Hot Topics 2018, American Bar Association publication, Chapter 7: "Doctors’ Defense in Medical Staff Hearings and Appeals: An Overview for Attorneys and their Physician Clients"
Co-author, Physician Law Evolving Trends and Hot Topics 2017, American Bar Association publication, Chapter 7: "Doctors’ Defense in Medical Staff Hearings and Appeals: An Overview for Attorneys and their Physician Clients"
Co-author, Representing Physicians, 4th Ed., American Health Lawyer Association publication, Chapter 24: "Structuring Physician In-Office Drug Dispensing and Compounding Arrangements"